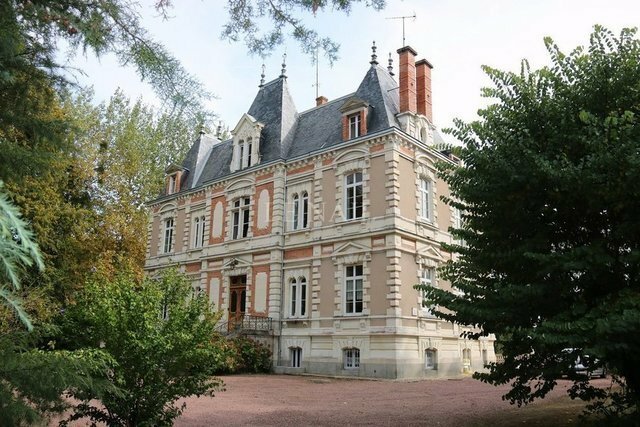 Ref.3472: Beautiful castle for sale in Pays de la Loire. This elegant castle is located in the department of Maine-et-Loire, 260 km West of Paris by the highway (access at 3 km) and at the exit of a small town of 3,300 inhabitants offering all the shops , services and schools. The chateau is an imposing stone construction, whose the facades are richly ornamented with bosses, moldings, and sculpted tufa chainage. It is implanted in its park, slightly high-rise, camped on a basement which raises it a little more. A large granite porch gives access to the reception rooms of the raised ground floor comprising: an entrance hall with a staircase with a remarkable cast iron ramp, two very beautiful living rooms and dining room, then the fitted kitchen with utility room, cloakroom, wc and service staircase. Above: 5 more bedrooms and 3 bathrooms, studio and storage room. In the basement, comfortable sports and leisure facilities: jacuzzi, sauna, steam room, sanitary... Direct access by an interior passage, to a beautiful large heated pool. Workshop, cellar, woodshed and boiler room. Living area of approximately 210 sqm per level. This beautiful park that surrounds the chateau, preceded by a wall and a gate, has beautiful mature trees, such as cedar, chestnut, and linden. All in about 9.500 sqm, closed by walls or fences. Only a small hidden shed covered with sheet metal allows accommodating a car and a little garden equipment. Some rooms in the basement of the chateau also provide materials storage units, accessible from the outside.